A 23 year-old woman is referred to the FNA Clinic for evaluation of a self-discovered left neck nodule which had been present for approximately 7 months. Her PCP had evaluated and administered a trial of antibiotic. Continued growth of the lesion motivated the patient to seek counsel from an ENT. Head and neck ultrasound showed a round, well-defined, solid and cystic, 2.1 cm nodule with calcifications and posterior enhancement. The nodule was located left of midline anterior to the thyroid cartilage. There was no lymphadenopathy. The salivary glands and thyroid showed homogenous parenchyma. 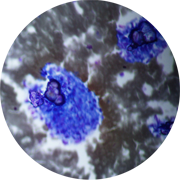 Aspirate smears from the FNA demonstrated a few papillary clusters with hypochromatic, irregular nuclei. Psammomatous calcifications were present. FNA biopsy was reported as papillary thyroid carcinoma, likely arising in a thyroglossal duct cyst. Conservative excision of the left neck nodule, which was distinct from the thyroid gland, showed a papillary thyroid carcinoma, mixed follicular and classic types measuring 1.8 cm. A small rim of background tissue consisted of normal appearing thyroid parenchyma. Papillary thyroid carcinoma arising is a thyroglossal duct cyst is a rare occurrence accounting for approximately 1% of all thyroid cancers. PTC arising in TGDC share the same excellent prognosis as those arising in the thyroid gland.